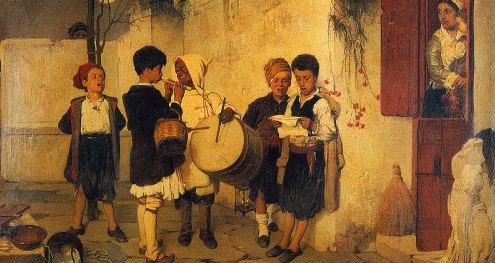 "Two pieces of art painted in the 19th century, by artists who are considered representative exponents of Greek Christmas folklore. They both studied in Munich, and both are representatives of the Munich School and the Academic style of painting, and they were professors at Athens School of Fine Arts. The famous "Carols," painted by Nikiforos Lytras (1832-1904) is an excellent typical example of a Christmas aspect of life in the Greek countryside and the province of that time: a group of boys, dressed in traditional clothing and carrying traditional instruments, sing carols in the courtyard of a farmhouse. Through the open door-window you can discern a traditionally dressed woman, holding a child in her arms, listening to the young musicians and singers. . . . . "